Quartet Records number 100 is out..! World premiere release of one of Henry Mancini's most romantic scores. In 1970, legendary actor-director Vittorio De Sica and famed producer Carlo Ponti joined forces to make Sunflower (also known by its original Italian title, I Girasoli). Set mostly in the wake of World War II, the film follows an Italian woman named Giovanna (Sophia Loren) as she searches across Russia for any trace of her vanished husband, Antonio (Marcello Mastroianni). What she discovers will change her life forever. The film received notable praise for the impassioned performance of Sophia Loren (who won a David di Donatello Award in Italy for Best Actress) and its breathtaking, Oscar-nominated score from composer Henry Mancini. At the time he was asked to score Sunflower, Henry Mancini (1924-1994) was a legend in his field. His unforgettable melodies for director Blake Edwards, in particular, had brought him internacional renown. The composer was specially sought after by De Sica and Ponti—who agreed on little but that Mancini was the perfect choice for their film. Mancini fully justified their confidence by producing one of his most beautiful and dramatic scores. Its twin love themes, capturing the rich flavors of both Italy and Russia, are exquisitely balanced between romantic longing and painful melancholy; while powerful themes for the characters’ journeys add depth and pathos. Sunflower earned Mancini an Academy Award nomination for Best Music, Original Score, and inspired the hit song "Loss of Love," with lyrics by Bob Merrill. It was especially successful in Japan, where Mancini’s celebrity rose to new heights. 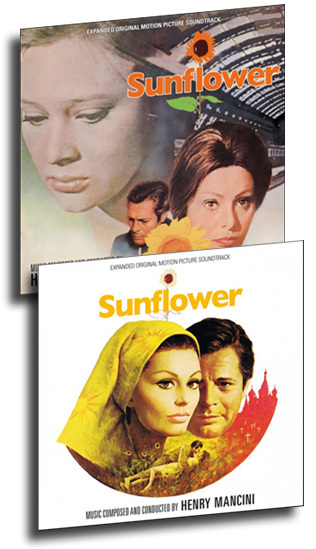 Although Sunflower was a very famous score and the LP released at this date was an incredible success (having been reissued several times on CD, though always in Japan), this is the premiere release of the complete score, including every note written by Mancini for the film (even several cues that ultimately were not included in the final cut of the film). For this definitive presentation Quartet Records has included the complete score written for the film on disc one, carefully mastered by Claudio Fuiano from the first generation mono tapes - the film was mixed in mono - recently found in Italy. On disc two they have included the remastered album version in full stereo, from its original sources courtesy of Studio Canal.